An ‘International Nitrogen Management System (INMS)’ will bring together the science community, the private sector and civil society to gather and synthesize evidence that can support international policy development to improve global nitrogen management. The ‘Targeted Research for improving understanding of the global nitrogen cycle towards the establishment of an International Nitrogen Management System (INMS)’ project or – ‘Towards INMS’ will deliver the INMS over the next four years. ‘Towards INMS’ is broken into four components shown in the diagram below. 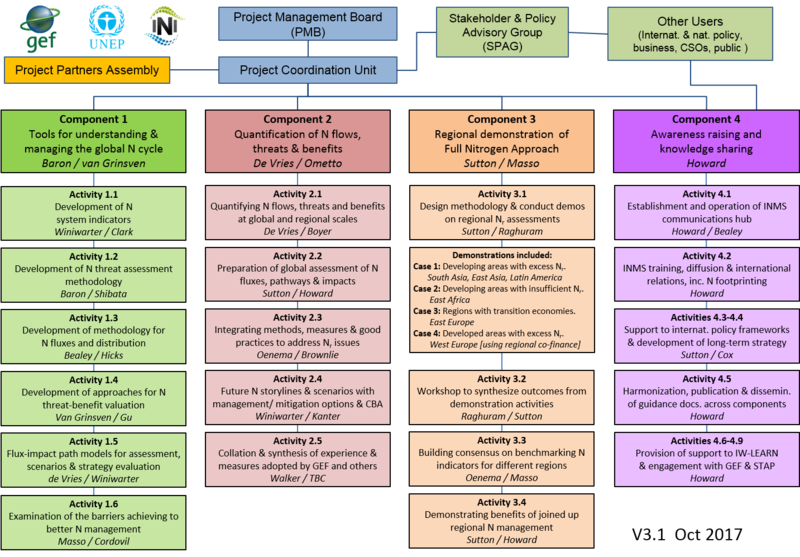 For more information on the project structure of ‘Towards INMS’ and the activities, tasks and task outputs under each component please click here. If you would like a copy of the Project Document and associated annexes of the project, you can download it here (please note the file size is 13MB). Please click here for more information on the people who make up the 'Project Co-ordination Unit' for the 'towards INMS' project, and here for why you should care about nitrogen in the first place!